You can buy tickets on the bus, but it costs about a Euro more so it’s best to buy them before you get on. To buy them you need to go to a Tabacceria. 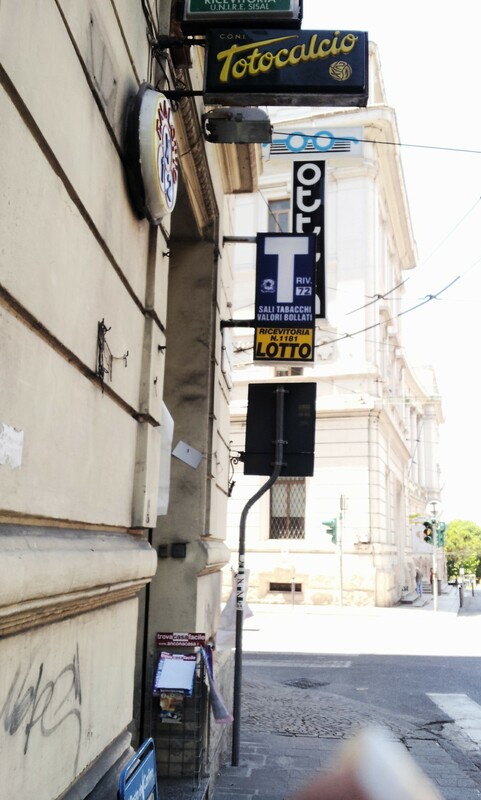 Tabbaceria’s are the “corner shops” of Italy selling cigarettes, chewing gum and bus tickets and sometimes a bit more. 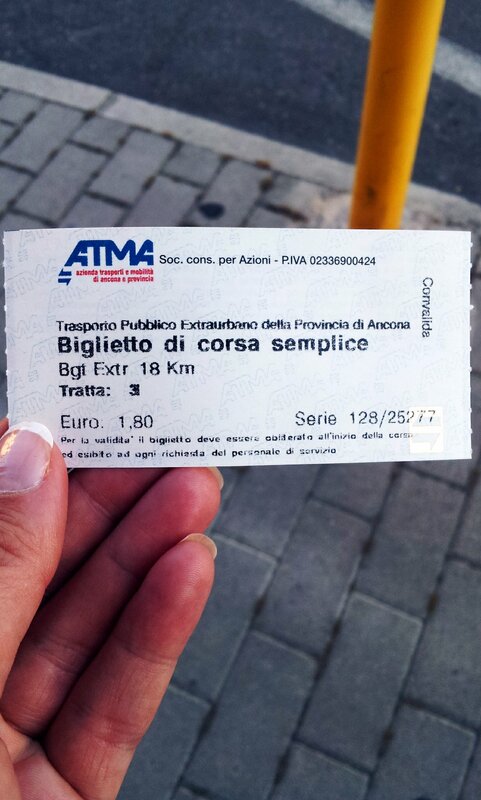 The cost of your bus ticket (in Ancona at least), is worked out on the basis of distance. 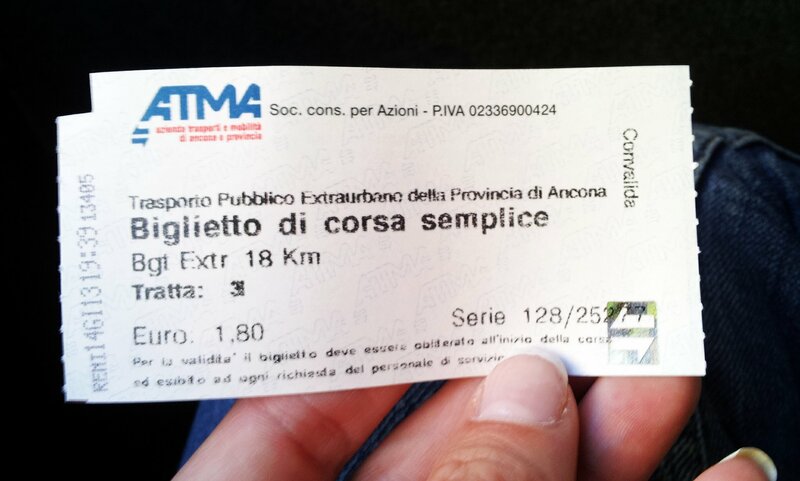 So for example for me to get to Ancona, it’s classed as 18km and I pay €1,80. To go to the beach, it’s something like 15km and I pay €1,50. Before you do anything: What day is it? If it’s a Sunday – you’ll be lucky if you wait only an hour or two for your bus. Best to check the bus times if you can find them. Here’s where you can find the bus times around the Ancona region. Bus timetables can usually be found on the bus itself too. Bus times are split into “Feriale” and “Festivo” – Feriale is week days and Saturdays, Festivo is basically Sundays. 3. Buy a ticket – they don’t seem to do cheaper return tickets, it’s the same price so if you want to come back, just ask for two tickets rather than one. You can say “Vorrei un biglietto per xxxx” pronounced “Voray oon bill-ee-yetto per xxxx” or if you want two, “Vorrei due biglietti per xxxx”. Un-stamped ticket – you can see it’s valid for 18KMs. 6. Get on at the front of the bus, say “Buongiorno” or “Buonasera” to your bus driver, that’s all you need to say and then put your ticket into a little machine thing which is usually on the left hand side of the bus at the front. The ticket will come out stamped with the date and time. This is the finished “stamped” result. 6. Occasionally ticket inspectors will get on the bus – usually it’s just a case of showing them your ticket. If he looks angry or starts to speak quickly in Italian, say “Sono Inglese, non capisco” and hope that he goes away. 7. If you want to stand a chance of getting home again then before you get off, ask the driver where to get the bus going back: “Dov’è la fermata per ritornare?” (doh-vay la fermata per ritornar-ay) and if you do it in a convincing English accent, like I have nailed, then rather than launching into Italian, he’ll hopefully point in the direction of the bus stop. Have faith. If he points to a random bit of road with no bus stop sign, it doesn’t mean he’s telling porkies – the bus probably does indeed stop there. That is all. If you have any other advice from this or other areas if I’ve got something wrong, please do let me know and I’ll add/amend! Thanks Alberto! That’s very helpful! I haven’t taken a bus in ages now – in my new town I think there’s basically only one bus a day!